An end result of the workshop was to form a committee comprising all key security personnel within the industry to address visitor safety and security issues throughout The Bahamas. “Ladies and gentlemen, attendees to this inaugural workshop, this is a space where you can speak your mind without judgment. Your contribution will be highly appreciated and taken into account. “There is much at stake. Our country’s chief livelihood is under serious threat. Your deliberations today at this inaugural visitor safety and security workshop hold the key to charting the way forward to a sustainable solution to secure the viability of our nation’s number one industry. 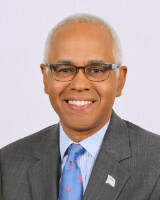 Mr. D’Aguilar said the Ministry of Tourism and Aviation and key industry stakeholders expend tens of millions of dollars annually promoting The Bahamas abroad. “With our alluring advertisement, each year, we are successful in persuading six million plus travellers to bypass competing tourist destinations and come to The Islands of The Bahamas. We assure our visitors that, here, in these islands is where they need to come and spend their vacation because we in The Bahamas can offer them a thoroughly satisfying vacation experience. Minister D’Aguilar told participants that he was confident they have the capability to develop the tactics, concepts and strategies needed to address issues related to visitor safety and security. “Those who are criminally minded are limited only by their imagination. But, keep in mind that criminals do not have a monopoly on imagination. In your work as safety and security agents, you no doubt spend a great deal of time reviewing in your mind your own solutions to security issues. “Well, today is the great meeting of the minds. Now is your time to bring to the table all those ideas, tactics, concepts and strategies that you’ve been incubating. Make your contribution to the think tank today. From your collective contribution, we will craft a blue print to secure the safety and security of our guests,” Minister D’Aguilar added.